So you're a highly sensitive child--you're affected by loud noises, you don't love crowded places, you're more likely to notice different scents, and you might even have very particular eating tendencies. You process information and your environment, including sound, sight, smell, touch, and taste more deeply than others. While it's true that your nervous system is on high alert - and sometimes the world can feel too big, too loud, too mean, or too fast - you also have some incredible talents--superpowers, in fact. Just like Spiderman, you notice small but important details that other people overlook. In fact, you experience your surroundings very deeply. Sometimes that means noticing a fallen bird's nest that needs help getting back into its tree. Or maybe that means finding every lucky penny on the sidewalk. Paying attention in this way allows you to notice some very special things. The best stories are the ones with the kind of attention to detail that make you feel like you're right inside the story. Because of your ability to take in the world so deeply, you have the words to narrate stories with exquisite detail. When there are so many stimuli, like sounds and smells and people and colors and textures to take in around you, it's never hard for your mind to find something interesting to dwell on. You are usually able to notice and empathize with other people's perspectives, because you listen to what they're saying. You hone in on what really matters to someone, and can then explain it to others. This makes you a natural mediator of conflicts. You're so open to noticing and even experiencing others' emotions, that you make an awesome friend. You also strive not to hurt the feelings of others. You are always noticing things, making connections, and learning about the world. That makes you want to know how all this stuff is going to turn out! You are curious about the world around you. You have a vibrant imagination--a trait that makes a great artist. You may not be great at coloring, or even drawing a straight line, but you have a certain depth to your way of thinking and feeling that comes through via creative outlets. Make sure you get to be creative as often as possible to harness this gift. You understand the characters in books or movies so well because you really understand the struggles or joys that the characters experience. You have an incredibly rich inner life! Your internal monologue, the way you reflect on events, and the way you process details is thorough and interesting. You have a tendency to daydream and fantasize. And your dreams at night may often be full of intricacy and emotion because you have so much going on inside your mind. Think about other words that have similar meanings to the term sensitive: complex, thoughtful, emotional, understanding. These are all qualities that, when harnessed and practiced, will help you grow stronger relationships and attachments to those you care about. You are very attuned to those you love, and they will appreciate you for it. One in every five people is recognized as being highly sensitive. 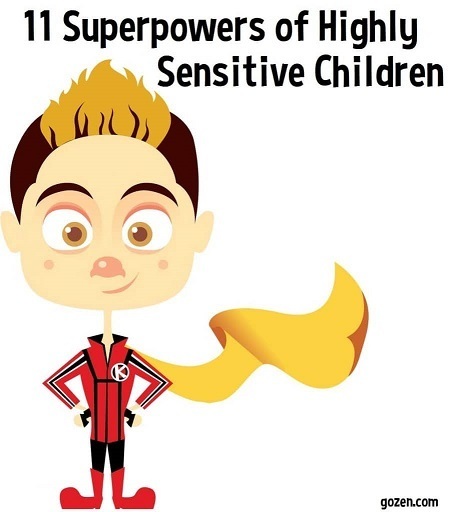 Here are some super-famous people thought to be highly sensitive: Albert Einstein, Carl Jung, Johnny Carson, Princess Diana, Jane Goodall and, of course, Batman. And you know what? It's so natural that it happens with animals too! If you haven't figured it out yet, being highly sensitive can be highly awesome. Way to go!